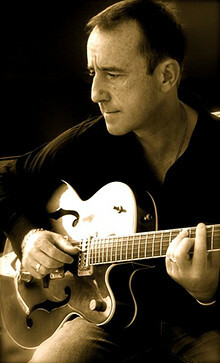 Dave has been a professional guitarist and guitar tutor for nearly twenty years. He plays and teaches all styles of guitar and has played in many bands. He grew up with a great love of 50s rock'n'roll and rockabilly music and later was drawn to the jazz swing style of his favourite guitarist Brian Setzer. Dave spent six years playing the part of Buddy Holly in a touring theatre show both at home and abroad. He has made many TV and radio appearances, and once performed to a 15,000 capacity crowd at Malden in Essex. He has also performed for the likes of Marty Wilde, Joe Brown, Freddie and the Dreamers, Dr Feelgood, The Searchers, Dexy's Midnight Runners, The Glitter Band and took part in Sir Cliff Richard's 50th birthday celebrations at the NEC in Birmingham. He has played every major theatre in this country, and once played a gig with Elvis Presley's drummer! Dave currently teaches guitar and popular music theory in local schools and privately. He has also taught classical and electric classes at the RGT Guitar Academy in Croydon, at Bexley Academy of Music and Performing Arts and at Goldsmiths College London. In 2002 Dave passed the much coveted LLCM(TD) teaching diploma from the London College of Music. He has since become a specialist, senior electric, acoustic, classical and bass guitar examiner for the Registry of Guitar Tutors and London College of Music. Away from guitar Dave has had various interests over the years. He spent many years studying martial arts and kick boxing, and after gaining a black sash at Shaolin Kung Fu helped run a club. However, now he is much more likely to be found by the river bank fishing in his spare time.